While I was writing my year end wrap up and posting how many books I have read with my son, I realized that I want to start doing a few reviews of the fabulous books we read together. It is also my son's 3 year birthday today, so I thought today would be a good time to start. We are serious library supporters, even before I started working there. I used to buy a lot of kids books for him but learned very quickly that I could not afford our habit! So the library has become our greatest friend. I won't post reviews for every book we read because I would not have enough time. I will choose a few here and there that I feel have a really great message and should be shared! We have been reading to our son really since he was inside but our reading ritual really started when he was about seven months old. It started with story time before bed and we read three books at that time. It has now progressed to a morning circle time of 1 or 2 stories, 3 books at nap time and 5 at night time. I pick the morning circle theme and he picks the rest. We have his books at his level and I rotate them weekly. Pete the Cat has become one of our very favorite stories to read. It's colorful, has a good beat to it and a very good message. Pete has new shoes but when he is out walking he steps in strawberries, blueberries, mud and water causing his brand new white shoes to change color. After stepping in water, they go back to being white. He rolls with it all and still loves his shoes no matter what color. "The moral of Pete's story is: No matter what you step in, keep walking along and singing your song because it's all good"
We love to sing along to this book and our son knows all the parts as well. It's a great feel good book that's perfect to read right now to start off the new year. The website is full of fun videos of live children's events reading the book out loud and lots of info on buying pictures of Pete and Pete stuffed toys! We spent the morning watching Pete on You Tube. 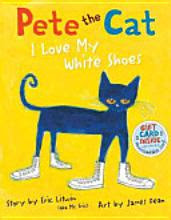 I couldn't resist posting this fabulous video of Pete the Cat dancing.! Adorable choice of book and you have to love the message. Thanks for the share!